GameSalad Developer Profiles are community focused features that profile and interview key developers within the GameSalad community. In today’s installment, we interview GameSalad developer, Matt Udvari. Udvari is an Austin game industry professional and has been using GameSalad for the past year. In our interview, we discuss his background, inspiration for game design, and his upcoming, unique puzzle game, Zig Zag Zombie. GameSalad: Hey Matt! Thanks for sitting down to chat with us. Let’s start off by talking a little bit about your background. Matt Udvari: I have a crazy, crazy, weird background. I went to college on a mixed acting/track scholarship. I basically ran between practices, rehearsals, and class all day. My parents said, just get a minor in something practical, so I got a CS minor. That paid off, because I went to grad school for game design. I also studied playwriting in grad school. GameSalad: How did you first become interested in game design? What types of games from your past inspired you to make games? Udvari: I have always been a gamer, but I actually came at game design from the theatre side. After I got my theatre degree, I came to Carnegie Mellon for game design, and because the theatre program is so well known. I wanted to get in a place to make awesome story-based games. I grew up loving all the Sierra games: Space Quest and Kinds Quest. And those are still some of my favorite games. My favorite game ever is Legend of Zelda, Majora’s Mask. It really shaped my idea that game stories aren’t good when they are narrative-based, but more when they’re environment and mood-based. GameSalad: Tell us a little about your professional experience in the games industry. Where do you work? How long have you been in the games industry? Udvari: I work at an Austin game development studio. They are the most amazing, supportive group of people if you want to make indie games. I feel really proud to refer people to them because it’s a great studio with a rare thing in games: quality of life. I’ve been making games for over 10 years. GameSalad: Tell us about your game development experience. What games have you made/worked on? And what kind of games do you prefer/enjoy making? Udvari: I’ve spent most of my career making console games. Blacksite: Area 51, Mechassault 2, Fracture, Night at the Museum DS. And I worked on a lot of iPhone and DS stuff. I really like story games, like I mentioned, but I’ve become a huge fan of iPhone puzzle games (which is why I made Zig Zag Zombie). After puzzle games, I like turn-based network games like Hero Academy. I like making iPhone and iPad games the most. With newer engines like GameSalad and such, I can make a game that is pretty much my idea, which is never the case on a large console team. 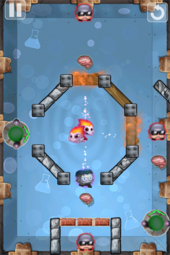 GameSalad: What made you decide to start developing mobile games as your own IP? Udvari: I’ve always wanted to make my own IP. As someone from a playwriting background, I care a lot about expressing myself and I see games as a way to do that. Zig Zag Zombie is more of a fun and stylized game, but I have a few game I want to make that are a little more story-based. Udvari: I’ve known Michael Agustin (GameSalad CPO and Founder) since grad school. A few years ago we had lunch and he showed me a prototype. We talked about me messing with it, but I was too busy getting laid off from game companies that year, as tends to happen a lot in Austin. GameSalad: What was the inspiration behind Zig Zag Zombie? 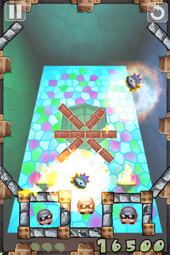 Udvari: I wanted the game to have an accessible, popular theme that still had some style. Every puzzle game seems to have animals and that’s it. So I thought, “Hey, why not cute monsters?” There are so many zombie games, so that was my only hang up. I didn’t want people think this is a bandwagon thing. 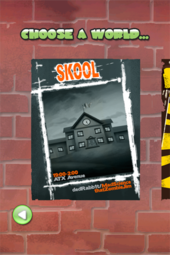 But I actually designed the game to be about a group of cute monsters who are in high school. The main kid is a Zombie, and I couldn’t resist the alliteration of Zig Zag Zombie, as well as the fact that the name hints at what you actually do. I think it’s important for casual games to have a title that alludes to the gameplay. GameSalad: Tell us about the team working with you. Udvari: It’s very malleable. People come and go when they’re able to help. We had two other designers doing levels and programming. One still helps and he is amazing. Our composer is super committed, mainly because he’s just a personal friend. We had marketing/social media help from someone who was a huge supporter of me. The characters are from a game industry concept artist. The props are a team effort between me and a game industry enviro artist. I had a short stint from a UI designer from the web industry who really helped clean up the buttons. The moral of the story is that, if you’re gonna do something this hard and you’re not funded, it helps to have good (and talented) friends who want you to succeed. GameSalad: Zig Zag Zombie is such a unique take on traditional physics mechanics with a top-down billards style. Where did you get the idea for this? And how do you think this unique style will help your game stand out and be enjoyable for your players? If you set up your shot, they stay set up when you reset. That way, you tweak what you got wrong and keep going. I think this avoids frustration. 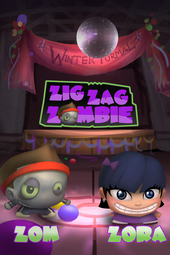 Zig Zag Zombie is designed for constant reset, try, reset try. This is because the characters remember their last setup every time you reset. If you barely miss the target, you just tweak. I love “set up and go” games like incredible machine and such. Even though this game is a different genre, I think the idea of setting up a scenario and watching it unfold is really rewarding. 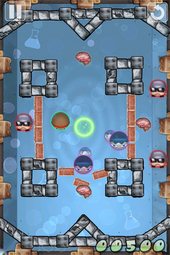 Zig Zag Zombie has strategic gameplay that’s not twitchy. When you press GO, you watch the fruit of your strategy, but it’s not a rush to move a lot of stuff around. I think this fits the casual genre better. Some levels are really hard, but not twitchy hard. I wanted to do a mechanic that I’ve never seen. I make games because it’s fun to invent things and tell stories, so it has to be at least partially unique for it to be worth the time. I’m sure there’s something random out there that has a similar mechanic, but I haven’t seen it. 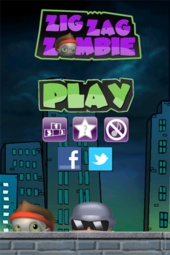 GameSalad: When do you plan on releasing Zig Zag Zombie? And on what platforms? Udvari: July! We are in review and hoping to release very soon. iPhone, iPad, Mac app store, and kindle fire. GameSalad: What is next on your horizon? Any games in development? Udvari: The plan is to put this game out and do the updates and new worlds. I have a new secret character already designed, and I’m looking to get his levels in there soon. After that, I’m hoping to make a darker, more mature game that still has puzzle elements. My hope is that Zig Zag Zombie builds enough of a reputation that my next game can use that as a calling card.